Remote work is growing rapidly across the U.S.: there are now 3.9 million remote workers (2.9% of the total population) who work at least half of the time from the comfort of their own homes. In the next 10 years, that number is predicted to skyrocket to one-third of employees working remotely. The benefits of remote work for both individuals as well as the company as a whole are vast and varied. From saving money (thanks to no overhead office costs) to raising productivity levels compared to in-office counterparts, it’s easy to see why virtual work environments are becoming a new norm. The rise of remote work brings some unique challenges for virtual teams in terms of collaboration. Thankfully, team collaboration has less to do with where each team member is physically located, and more to do with the team’s communication style. Oftentimes in a virtual office setting, employees experience and take part in “bursty” communication, or, little time between exchanges. These bursty exchanges help teams quickly agree on goals, and puts more of an emphasis on work rather than constantly talking with no end goal in sight. However, the lack of everyday, face-to-face communication can be a difficult challenge that many virtual companies overlook. Strong relationships between managers and employees can be a task to build, and the everyday social interactions that in-office workers take for granted can be cumbersome to try and recreate virtually. This is where we see “transparency,” in a virtual work setting come into play. Transparency is, arguably, the most important central aspect of creating a successful collaborative virtual work environment. It’s a simple cause and effect, chain reaction: transparency leads to employee engagement, which then leads to productivity. Creating a transparent work environment doesn’t just happen overnight, though. You need the right tools in place to help create a transparent workspace, and it all starts with the technology you use. Real-time Communication: Because employees in a virtual setting don’t have the opportunity to catch up on small office talk in the break room or walking to get a cup of coffee, real-time communication tools allow for more personal interactions. Utilizing tools like Slack or Skype to chat throughout the day can aid in colleague communication, and help to achieve a transparent environment. Collaborative Documents: Working virtually and having strong organizational skills often go hand-in-hand. Keeping track of assignments or calendars is easy to do with collaborative documents via Google Docs or other doc-sharing platforms like Dropbox. Edits are made automatically, so all co-workers can see exactly what stage a project is in, promoting transparency further. Regular Meetings: Although we’ve already covered communication, it’s important to differentiate casual, real-time communication and planned communication through regular meetings. 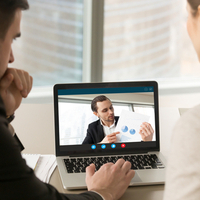 Having planned and scheduled team meetings and one-on-one meetings helps promote collaboration in a transparent environment, and can be done via conference call with shared screens on ReadyTalk or Join.me. Now that you’re equipped with the right tools to create a transparent virtual work environment, it’s important to remember that access and leadership play a large role in maintaining transparency. Some virtual companies swear by cell phone access for easy calling or texting during the workday. Many believe (rightfully so) that a transparency company culture starts at the top of the chain with management. There are many tools – technology-based or otherwise – that aid in a transparent virtual work environment, which leads to more collaboration, and in turn, productivity.